Needing a box to ship a rather small package, I resorted to an old frugal trick for making a box as small as possible. I used a cereal box, cut it down and turned the outer half of the two-piece box inside out (for writing a mailing label on the plain brown cardboard). 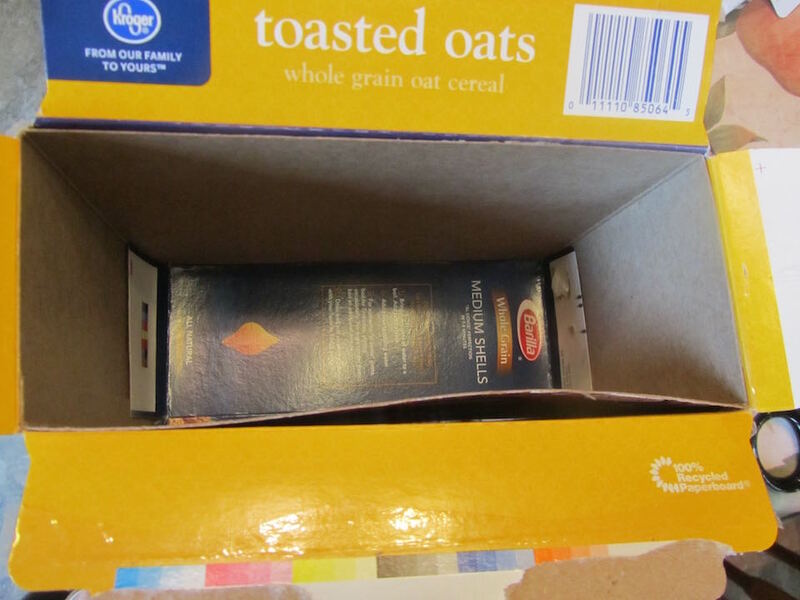 Cereal boxes can be pretty flimsy, as is. 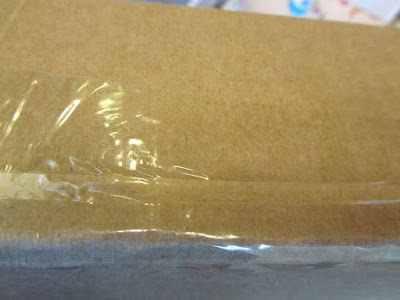 But there's a way to reinforce that flimsy cardboard with a second layer of flimsy cardboard. (Trust me, you do wind up with a somewhat sturdy box.) This isn't a substantial box that you might ship fragile items in, but non-breakable items-- definitely. AND, this is also a great trick for making small gift boxes to be over-wrapped in gift wrap, when you don't have a suitable gift box. 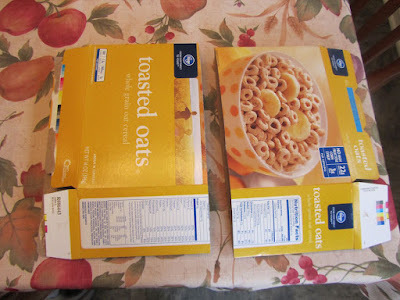 The holidays will be here soon enough, and I just wanted to make sure you knew how to make one of these boxes (you'll be needing to save various food boxes, for an assortment of sizes, and if your cereal consumption is like ours -- practically non-existent -- this could take a month or two). How is this frugal, you ask? Well, this is frugal in two senses, if making a shipping box. One, by making a box as near as possible to the item's size, the box itself, and any fill material will weigh less, therefore costing less in shipping charges. And two, if my option is make a box that fits right now, or wait a few days until I come across a suitable box, I may wind up paying expedited shipping charges, because I'm running out of time to get a package in the mail. Getting that box made, packed and off to the post office, pronto, means I can use the slowest (cheapest) mail delivery option, and still have my package get to its destination on time. I'll show you how I cut down a food box into a smaller box. Here's the one I made to send the giveaway spices to Mary (the winner of the drawing last week). I used a store brand cheerios box and a pasta box, a ruler, pen and scissors, and glue stick and packing tape. With the cereal box, I undid the bottom flaps on the box (the top flaps having already been undone to use the cereal), and flattened the box. I used the ruler to measure and mark the halfway point on the box to cut it into 2 equal halves. After cutting the box in half, I redid the bottom flaps on one half, and secured with packing tape. As is, the bottom flap will easily push in. So, I reinforced the bottom flaps on the inside of the box, with a piece of pasta box, cut big enough to cover the inside of the bottom of the cereal box. 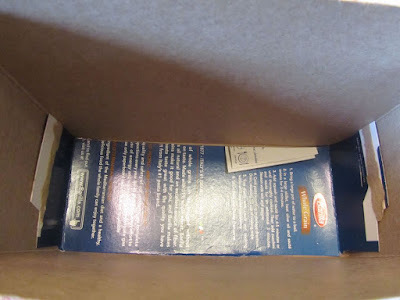 As luck would have it, the side of the pasta box (with flaps) was just the right size to use inside the cereal box, with flaps extending up the sides of the cereal box a couple of inches. 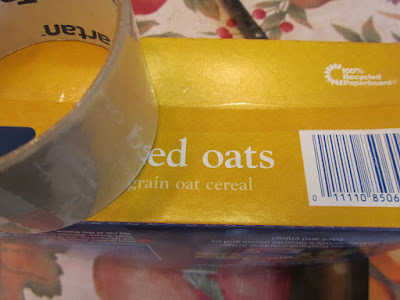 I used the glue stick to glue this reinforcement into the cereal box. 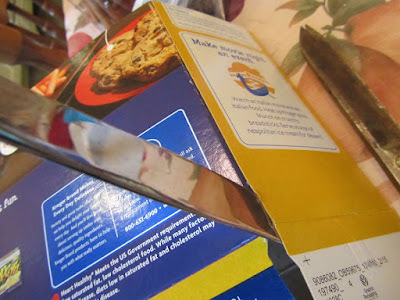 With the other half of the cereal box, I carefully undid the side glue. 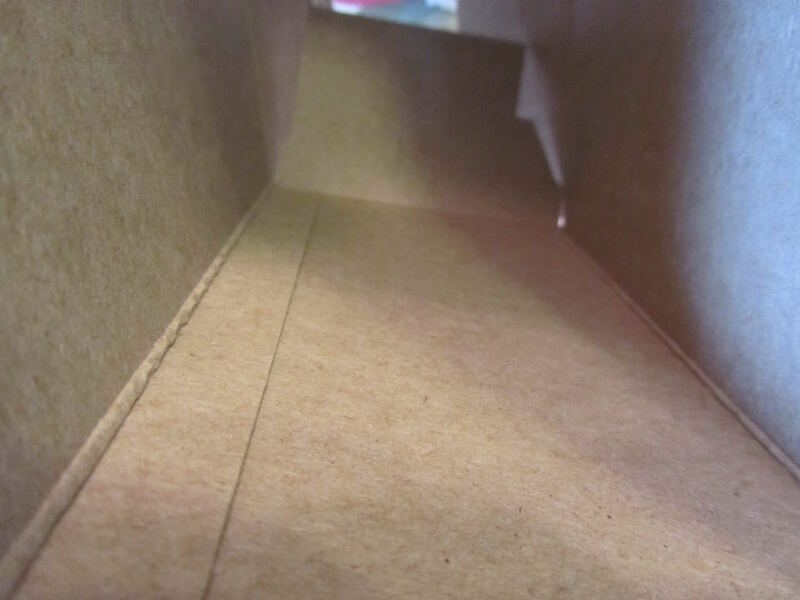 If you look at the inside of the food box, you'll find the seam, where a large piece of cardboard was made into a rectangular tube. 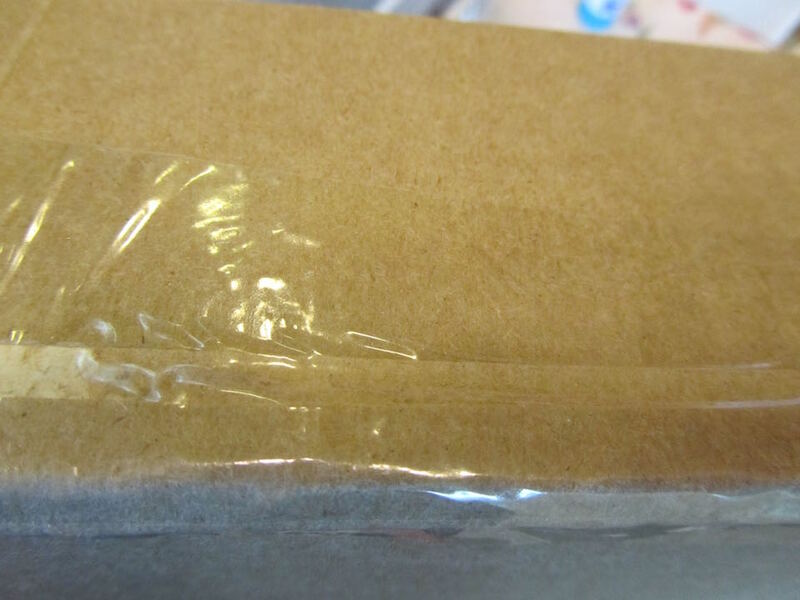 Using a table knife, I very carefully slit along this seam, keeping as much of the cardboard overlap intact as possible. I turned the cardboard inside out, and wrapped it around the other half box, to get the right fit. I "let out" the outer cardboard just a smidge, enough so this piece of cardboard will fit snugly around the other finished half of the box. 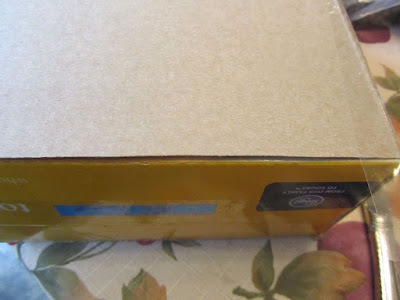 If you have help, pull the outer box snug against the inner box, and at the same time, tape the outer box in place, along this seam. If you are doing this on your own, you may need to tape the outer box along the new seam, flat on the table, then slide/push the inner box into the outer box. ** important -- when you are done with this step, you want to have the flaps of the outer box at the open end of the inner box. 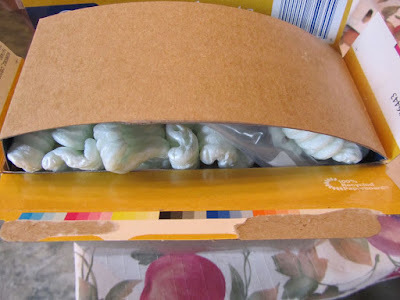 Fill the container as full as possible, adding packing material, as needed. Add a second piece of cardboard (I used the other side of the pasta box), to the top of your packing, to reinforce this end, when closed and taped shut. Close the flaps and tape the box shut. You now have a brown surface for writing your to/from information. I use a Sharpie permanent marker for the to/from, then I cover over with clear packing tape. I also, go around the box, with packing tape, one more time, to secure the side seam that I taped into place. And I tape all other connections of the inner and outer box. It's not as quick and easy as if you had a box just lying around the house. But when you don't have a small enough box (or, in my case, any box at all), then this is a great little trick. Cutting down a food box takes me about 20 minutes, total. 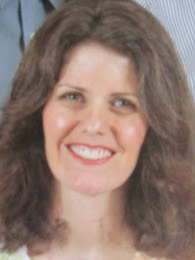 My alternatives were to buy a box for a couple of dollars (and then pay shipping fees on top of the box price), or to go with Priority Shipping (the box is included and available at the PO), which would have cost several additional dollars in postage. So, for my 20 extra minutes, I saved a minimum of $2 or $3, which is an hourly wage of $6 to $9. Mary, if you're reading this morning, could you comment on the condition of the box as you received it? Did it arrive intact? Should I have added extra tape or reinforcement anywhere? Thanks for your feedback! I was so impressed with the creative and sturdy box that the wonderful cinnamon sticks and cloves arrived in! It was in mint condition, and the tape was very sufficient. I will remember your method if I am ever without the right sized box for shipping. I have a reasonable stash of boxes that I think will be good shipping boxes in my garage. There are times when the box is too big or slightly small and I get creative with cutting it down or adding to it in a way that won't compromise its strength too much. That, paired with Dollar Tree package tape, makes for a fairly inexpensive shipping box. When sending things that are heavier or needing to send them further within the US, Flat Rate USPS boxes can be a real money-saver. The post office supplies these boxes. There have been times when I have taken my package unsealed, and used the self-service mailing kiosk to see what the rate would be in my own box versus the Flat Rate fee and then switched boxes there if the price was better. I take my tape and a marker pen, sealing and addressing it there. The few dollars that I have saved per box has made the slight inconvenience worth it to me! Sometimes when I think that postage prices are just way too high, I remind myself how much it would cost me to hand-deliver the gift I want to send, and that puts it way into perspective for me!!! Thanks again for the lovely giveaway! Oh good! I'm so glad it held together well. 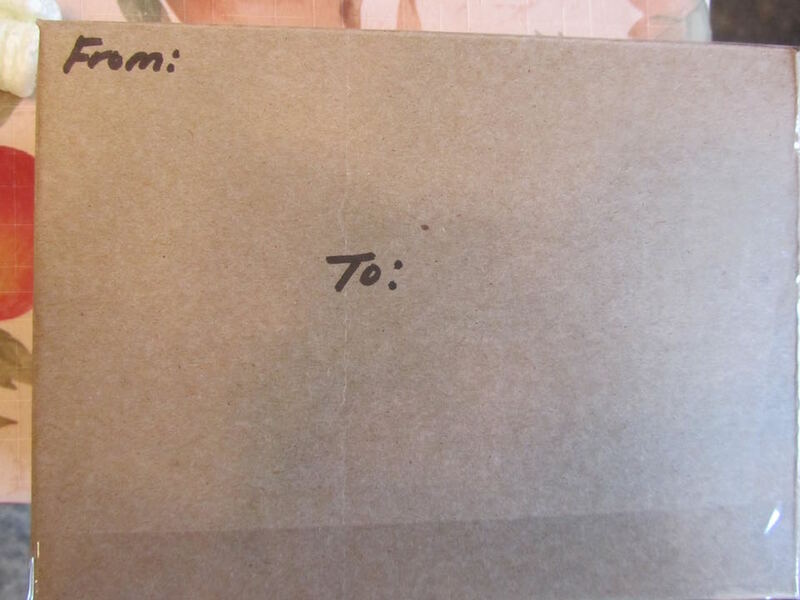 I sometimes pick up the smallest USPS Flat Rte box (the size to hold a video cassette), before shopping for a gift. Then I can take the box with me, and find contents/gifts that actually fit the smallest size. I find it very frustrating to buy a gift, then discover it's just barely too big for one of the sizes of Flat Rate boxes. 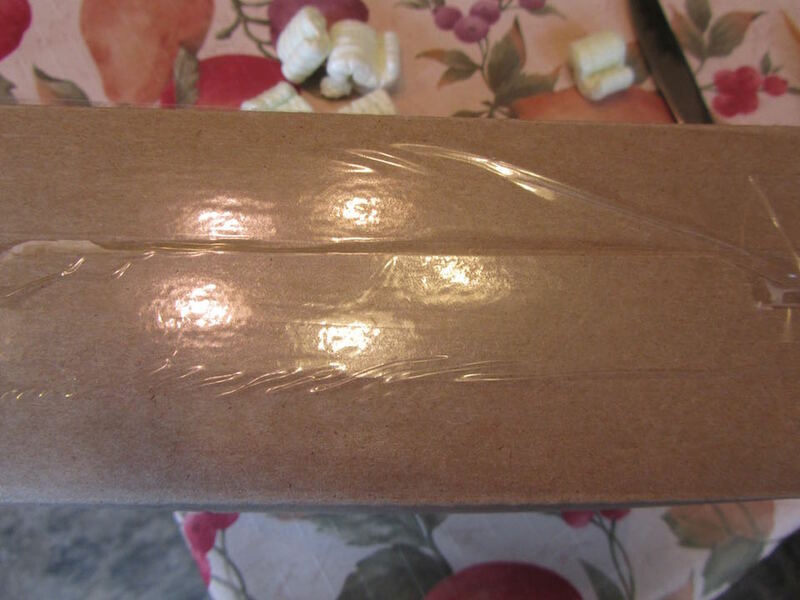 Good idea to bring your package, unsealed to the PO and compare the shipping your box vs. Flat Rate boxes. I'll be doing that in the future! Also, a lot of items can go into a padded envelope, and ship for less. Weight-wise, I noticed on the read-out at the PO desk, that if my package had been in an envelope it would have shipped for less. Ouch! I'm sure that was a painful moment! I've done similar things. The USPS has a padded flat rate priority mail envelope that has saved me a bunch of money many times with shipping my ebay sales. They are normally not available in the post office but you can order them online delivered to your house for free to have on hand. I use them often & sometimes if something needs more protection I put a box inside it, they will not say anything as long as it fits in the envelope. Plus if you print the shipping label online instead of paying at the post office it is less expensive & since it is flat rate you could print at home as the weight would not matter. I think the online rate for the padded flat rate is only $5.35. Sorry if that was too much information, but since I ship a lot I thought I would chime in! That's not too much information at all!! So helpful! I saw the padded envelope on the USPS website, and the cardboard flat rate envelopes at the PO. Good to know about putting a box in an envelope! That could save a lot of money for someone doing a lot of shipping, as in a home-based business like yours. I didn't realize that the shipping cost is reduced if you print your label at home, instead of at the PO. Good to know! I'll poke around the USPS website and see how to go about that. That is great information, Rhonda! I will definitely be looking into those flat rate padded envelopes! I think your time savings may be more than 20 minutes since you have to consider the time (if not money) shopping for the right sized box, which as you said will be a lot bigger than the contents. Much like how Amazon ships their items, big box for such a small item which they then have to stuff with poly pillows. I like to calculate whether doing certain tasks are worth my while too. That way I can evaluate whether to continue or not. You're probably correct on time savings. In our own house I just made a quick look into the various closets that I know boxes get tossed. If I had gone to someplace to buy a box, I may not have found the exact size I wanted, and ended up going someplace else. Just getting in the car and driving someplace will eat up 5 to 10 minutes each way, then standing in line to make a purchase, etc. My other frustration with receiving items shipped to me is some of them come in way too big boxes, and stuffed with non-biodegradable packing peanuts. I then have to store those, until I have enough to take to a shipping place that will accept them. I'm embarrassed our spare bedroom now have 2-3 shelves of old boxes, and one or two padded envelopes. I almost never buy something to post a package in, and last year, relished wrapping boxed over wrapping the odd shaped items inside (like clothing, it never looks as good as a lumpy package!) for Christmas. You're right on wrapping clothing and other soft items -- they never look as nice when just wrapped, as is, as when put in a box and wrapped. The paper gets all wrinkly, and seems to tear more readily. You are so clever! I didn't know this trick. My mom did teach me how to get a nice length of brown paper out of a paper bag--cut down the seam, cut out the bottom, and there you go, great for wrapping. Now if only I could get someone to do the wrapping and mailing for me at Christmas--I hate that job!!!!! Oh, yes, and you can pull out the folded up part of the bottom of a brown paper bag, and get an extra inch or two, across the bottom edge. I try to hang on to the lighter weight brown bags (like the weight of lunch sacks), to use for gift wrap, as it's easier to manipulate than the heavy-duty shopping bags. My husband likes to take a plain piece of cardboard and make a box to fit an item. I'm not very good at it, so I leave the box making up to him. How very handy to have your own resident box maker, on site!! Take advantage of that! Definitely cheaper than buying a box! I'm always tickled when someone sends me something and it comes in some sort of unusual packaging. Great idea about making a box.Will come in handy for the holidays. Over at hip 2 save , under freebies there are some magazines right know. I will only do the ones that are totally free. that you do not have to put in credit card info. Better Homes and Gardens works. I got some for out of town friends and family. This saves shipping. I will keep checking back ,until Christmas.There will be more free mags. 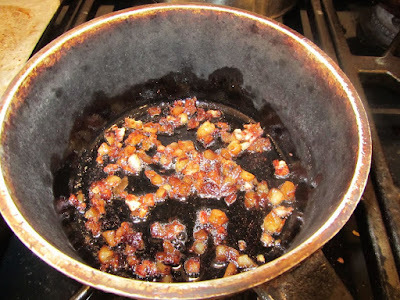 Thank you for the stain removing tip it worked great. I saved 2 shirts so far. I have 3 more to go. Oh, great to know about hip 2 save! And that is a fabulous gift idea, the magazines. No postage, and when you can get the magazines as freebies, even better! I'm so glad the stain removal tips for deodorant stains worked for you!